Our library system holds over 40,000 materials including 36,775 books/e-books/large print, and 2000 CDs/DVDs/VHS/audio-books. In total, 10,920 items were checked out of the system during fiscal year 2015! In addition to these items, the library was utilized in many other ways, including the use of our computers, internet, WiFi, and to attend Library events. We are eager to be of any assistance, contact any of our friendly and professional staff members. Welcome to the Palacios Library! On June 15, 1910, the Palacios library was organized by twenty local women. At the end of 1910, the library had 104 members, 325 books, and $150.00 in the treasury. The library was housed in a narrow framed building, which was once the town box ball alley. Palacios Library in the town box ball alley. In 1961, the library association reorganized with a 12-member board. This board faced multiple problems: lack of funds, an inadequate building, and obsolete books. 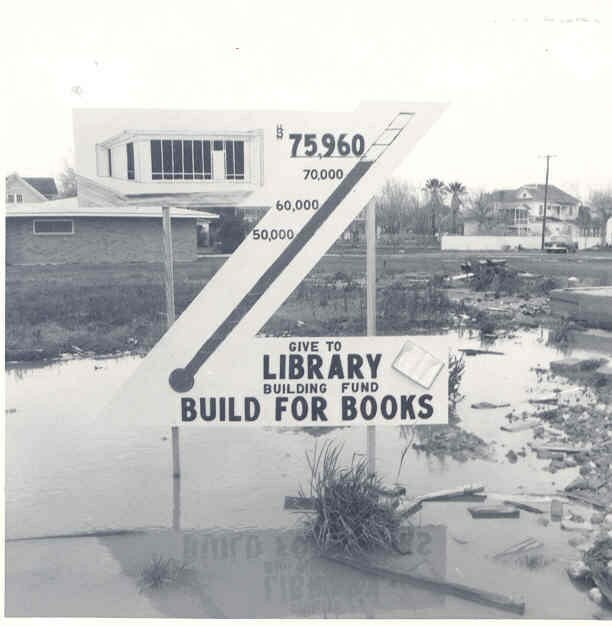 Then Hurricane Carla wreaked havoc on both the library and town of Palacios. September 1961 found the Palacios Library full of mud, hay, and dead animals. Nearly all of the books were destroyed. Mrs. Phyllis Burson, head of the Corpus Christi Libraries came to the library's rescue with almost 1,000 books in the back of her station wagon. These excellent books were the gifts of libraries from all over Texas. At the same time, the disaster funds made it possible to purchase approximately 1,200 books. 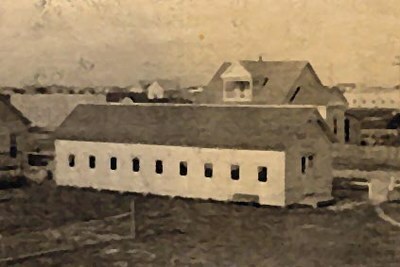 The city of Palacios allowed the library to be temporarily housed in the old Bay View Hospital. Mr. Lichtenwalner of Illinois sent over 1,000 books. Small and large amounts of money continued to come in, $1,000 was given by two former residents. The Athena Club were on hand to help where needed, 2 worked as librarians, others in processing books, 4 volunteered for story telling, and others helped with various other tasks. Books then totaled 3,500. Temporary home of the Palacios Library in the old Bay View Hospital. These new books were processed for the first time according to standard library processing. With a new set of books and a building to operate in, the library needed volunteer assistance to keep it operational. The Athena Club agreed to help along with the Book Ends which was a group of high school and junior high students. The Palacios Library achieved tax-exempt status and became a non-profit organization in 1964. At this time, plans for a new building were drawn. With a gift of $7500+ a lot on the corner of Fourth and Main was purchased. A budget of $75,000 would be enough to build the new library with modern facilities. 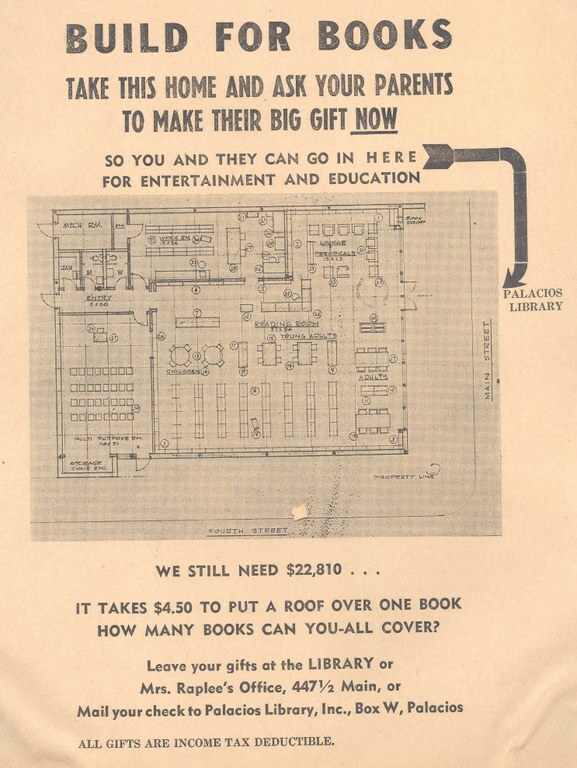 Fundraising began in December 1965, with “The Build For Books Tea” sponsored by the Athena and Alpha Club. The Palacios Beacon aided in the fundraising process by adding the library's weekly column the “Palacios Library News”. The Matagorda County Tribune also assisted in the attempt to let the public know what was needed. Palacios area public schools sent out leaflets asking parents to give what they could, suggesting, “It takes $4.50 to put a roof over one book”. Every business in Palacios and the local area were sent letters asking for donations. At the building site, a thermometer let patrons know how close the library was to its fundraising goal. Gifts from $1.00 to $25,000 came in from a variety of private sources. In late February 1966, an unexpected gift from a Houston foundation put the drive over its goal! The dream of a new library was about to become reality. The goal thermometer located on the building site. Snap shots of the construction of the new library. The Texas State Library consultant was invited to the library to discuss ways of improving the library and its services. Children and youths under 21 would pay no fee, adults paid .25 yearly. The Athens Room served as a meeting room for educational and cultural clubs or groups without charge. Local clubs and individuals sponsored subscriptions to magazines. Moving began when the shelves and chairs arrived from New York City. The librarian, Mrs. Pena, and volunteers moved 6,200 books to their new air-conditioned home in a few hours, by box, truck, and car. The Alapha and Athena Clubs hosted a formal opening on April 23, 1967 and everyone was amazed to see the state of the art library. Circulation increased from 6,055 in 1966 to 12,424 in 1967. At the time, the library was open 31 hours weekly, a variety of morning, afternoon and nights. The Matagorda County United Fund contributed $1,850.00 toward operating expenses, a private source underwrote the librarian’s salary for one year, and the city continued its $300.00 yearly support. Volunteers assisted by helping patrons, typing, processing books, ordering new books, 'manning the front desk' and straightening the books. 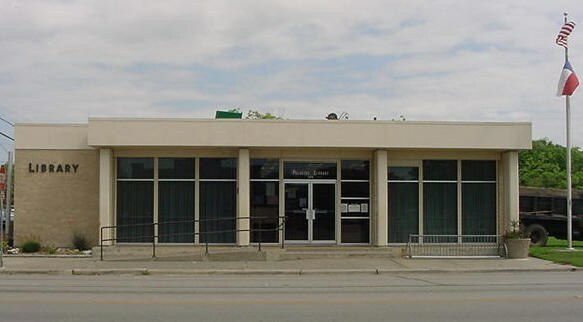 Palacios Library before the new roof was constructed in 2002. In August of 2000, the library began offering after-school homework assistance in the form of high school tutors during the school year. This program has been a consistent presence at the library ever since. Often the children needing assistance grow up to become some of our best tutors. 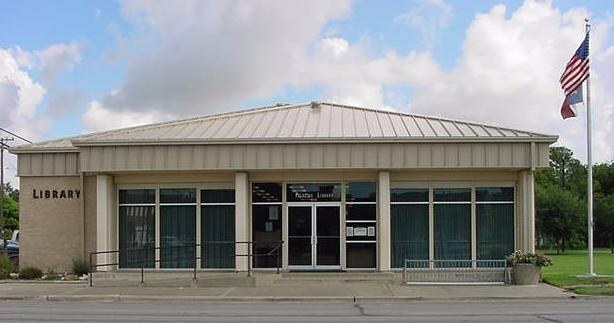 Palacios Library after the new roof was constructed in May 2002.